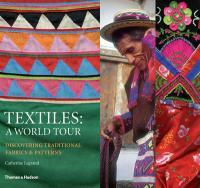 Textiles: A World Tour: Discovering Traditional Fabrics and Patterns. Pieced together much like the fine garments it portrays, this colourful book takes the reader on an international textile tour, presenting in glorious photographs, samples and sketches a raft of remarkable clothing from all over the world. Taking the reader from Vietnam to Benin, from Central America to Eastern Europe, the book is brimful of stunning costumes, vibrant fabrics and breathtaking detail. All designers and anyone who loves fashion will find this volume a huge source of inspiration, as will all fans of off-the beaten- track travel destinations. New Hardcover 28*25.5 cm, 240 pp.